Admittedly a big part of why I'm so committed to reading more Doctor Who novels as of late has to do with my recent forays into running the Doctor Who: Adventures in Time and Space (DWAITAS) RPG. Reading more and more adventures of the various incarnations of the Doctor is proving to be tremendously useful in terms of inspiring new adventure ideas for future games. Sting of the Zygons turned out to be a book featuring the Tenth Doctor, as portrayed on TV by David Tennant. In many ways I'll always feel that Tenth is "my" Doctor, in such that he's the one that I developed the strongest affinity for in terms of the Doctors thus far. I wonder if the author had any idea that the Tenth Doctor might actually have to face the Zygons in a later televised adventure. As much as he never encountered these craft shape-shifting aliens during his television run, the 50th anniversary special The Day of the Doctor actually made this little moment come true. Not bad for a book published in 2007 just as Martha Jones first joined the Doctor as his Companion. 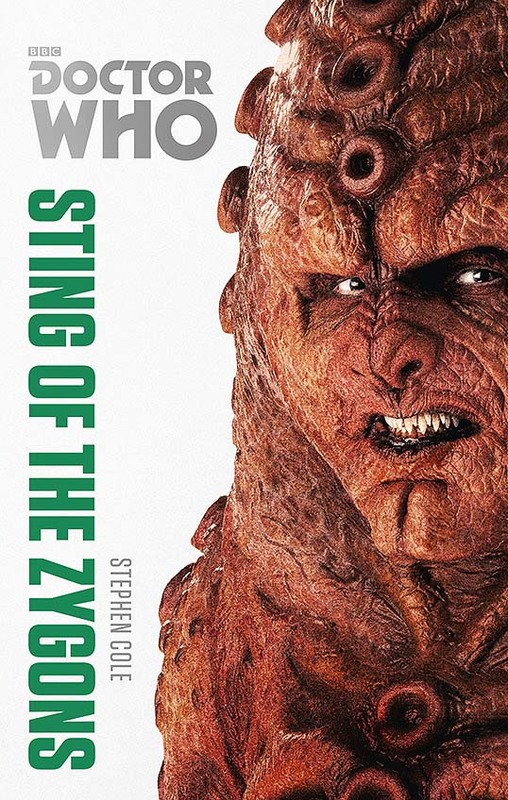 Synopsis: Doctor Who: Sting of the Zygons is a Doctor Who novel written by Stephen Cole and has been re-issued as part of the Monster Collection of Doctor Who books. The Beast of Westmorland has been terrorizing the neighboring villages and everyone from hunters, naturalists and even photographers have been trying to track down the elusive creature. But as the Doctor and Martha arrive in the TARDIS, he quickly realizes that the beast appears to be a Skarasen, the giant beasts known to provide the essential lactic fluids that the Zygons needed to survive. If a Skarasen was loose in the area, then the Zygons couldn't be too far behind. As the Doctor tries to figure out a way to bring the Skarasen under control, Martha also gets to know the townsfolk better and the different personalities in power. But given the threat of Zygons disguising themselves as humans, she begins to suspect that certain individuals may in fact by Zygons. But how will she prove who is human and who isn't? And what is the master of the Zygons? Why are they allowing the Skarasen to be hunted so publicly when this is also their key food supply? The story as a whole plays out just like any episode of the current Doctor Who series in terms of tone and overall spirit. And thus it was quite the fun read as we struggle to keep up with the Doctor, who of course is going a mile a minute as he tries to figure out what the Zygons are up to. And the dialog for the Doctor was pretty spot on in terms of capturing his almost random asides and outbursts as he tries to wrap his head around a problem. For a book that was written before Martha Jones formally appeared on TV, Cole did a tremendous job of also bringing Martha to life in this story. Some of her quips and asides were perfectly in tune with the character, including that odd sense of the Doctor just leaving her alone despite all that was going on. Seriously, Martha can never catch a break, it seems, even when folks who don't know her yet very well write her into stories. Admittedly it took me a while to full wrap my head around what the Zygons were up to - and from a mystery perspective, I suppose that's a good thing. And while I could have appreciated more clues to help further foreshadow some of the latter events, on the whole it still felt like a nice little reveal as everything came to ahead. And as expected in a Zygon story, half the fun was trying to be right there with the characters in terms of trying to figure out who was really a Zygon in disguise. Some of my early hunches proved to be correctly, but there were still a few reveals that totally caught me by surprise. And those moments didn't feel like horribly plotted, impossible to guess twists. Ultimately they felt like great twists in the story that made things all the more compelling. Still, there were a few twists that sort of pushed the limits of what could be expected, but I suppose that's only natural in any book that generally follows a mystery format at its core. And for so short a book, there were still bits that felt a little extraneous and not quite as essential to the core narrative. Even the ending felt like things went on a wee bit too long, as if we could have wrapped up the story at an earlier point. But hey, these things happen. Doctor Who: Sting of the Zygons is a fun little romp with the Tenth Doctor and Martha. It has some great moments but on the whole could have been a bit more polished. Still the book gets a good 4 Zygons hiding in plain sight out of a possible 5.